Fig. 1　Sketch of momentum, heat and mass transfer in a tropical cyclone. Fig. 2 High-speed wind-wave tank. Fig. 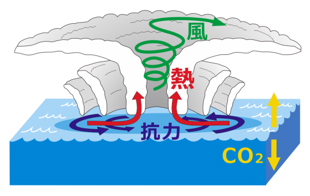 3 Drag coefficient CD against wind speed U10　. Fig. 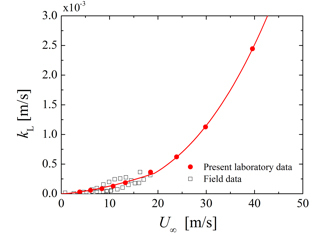 4 Transfer coefficients of latent and sensible heat against U10. Fig. 5 Mass transfer coefficient against U∞ . (1) Takagaki. N., Komori, S., Suzuki, N., Iwano, K., Kurose,R., et al., Strong correlation between the drag coefficient and the shape of the wind sea spectrum over a broad range of wind speeds, Geophys. Res. Lett., Vol. 39, L23604 (2012). (2) Onishi, R. and Takahashi, K., A warm-bin-cold-bulk hybrid cloud microphysical model, J. Atmos. Sci., Vol.69, 1474-1497 (2012). 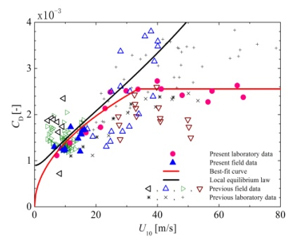 (3) Iwano, K, Takagaki, N., Kurose, R., and Komori, S., Mass transfer velocity across the breaking air-water interface at extremely high wind speeds, Tellus B, Vol.65, 21341 (2013).